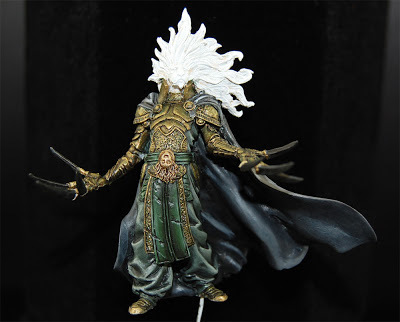 Here is a little update on what I'm working on now, the Lion Knight 2 by Kingdom Death. I think today i'm going to start on his face and make him look like a traditional lion although not a bright tan lion but more of a dirty darker fur lion. I'm not sure what I'm going to do for a base yet or if I want to use what he came with. I guess I will find out when I reach that point. Ok kiddies, here is my newest monstrosity. This is Siobhana Of Weissburg by Reaper Miniatures. This gal has been around for ages and i'm not even sure how I ended up with this figure. 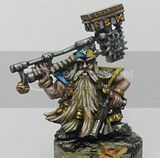 I think it might have been when a friend bought out a shop of their minis when they were going out of business. But she is for the WAMP painting contest as I wanted to get something done with out having to put my heart and soul into it. I chose her because she had her own atmosphere and I wouldn't have to build something myself. (I know it's totally lazy of me) But sometimes you just need something quick and dirty. It took me a few hours but I finally found a zen with her and got her painted up pretty quickly. 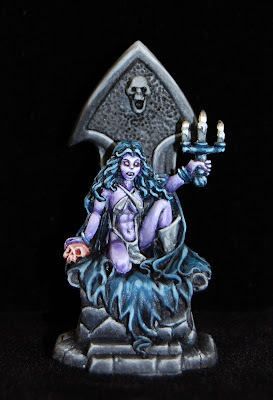 I could probably fiddle around with her for a few more hours but i wanted to get started on my Kingdom Death contest entry since I only have a month and a half to get it finished. So expect some work in progress posts over the next month. Anyways I hope you enjoy my little purple vampire.